Represent Lake Country Manufacturing with this official t-shirt! 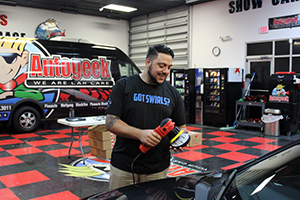 In the last 40 years, Lake Country Manufacturing has grown to offer a full line of professional buffing and polishing products for the automotive, marine, aviation and composite industries. Their products are now offered in over 50 countries worldwide. Along with their focus on product development, Lake Country Manufacturing continues to invest in upgrading and automating their manufacturing operations to provide the highest quality and consistent products on the market. Be a part of the Lake Country Manufacturing crew with their newest Got Swirls t-shirt! This black shirt features the pun, “Got Swirls? 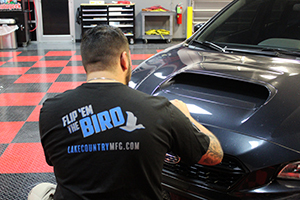 Flip ‘Em The Bird” with Lake Country MFG’s logo in blue and grey.